No matter what discipline you ride, everyone can agree on one thing: leg protection is important. 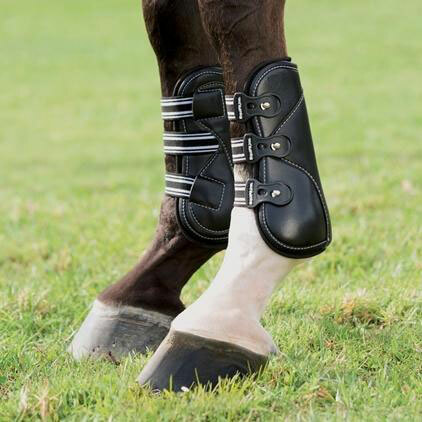 Whether you have a young horse who doesn’t quite know where his feet are, a horse who interferes with herself, or you want to shield your horse from cuts and blemishes in turnout, choosing the right boots can make all the difference. Like so many things in the horse world, there are many options to choose from when it comes to horse boots. Here, we’re going to tell you about the different types of boots available to help you find the perfect ones for your horse’s needs. Sport boots, splint boots, and all-purpose boots go by many different names, but are considered to be all-purpose boots because they wrap around the entire lower leg and can be used for a variety of different purposes. 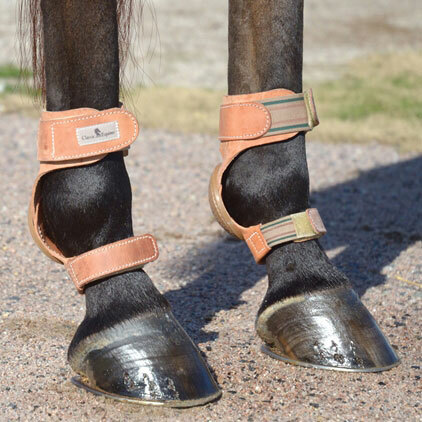 They cover the tendons, the cannon bone, and the inside of the fetlock, and often have additional padding on the inside of the leg (sometimes called a “strike pad”) to protect the medial splint bone from potential concussions. The outer shell can be made with materials such as neoprene or leather and are lined with neoprene, fleece, or wool. They are typically secured with Velcro closures. When choosing all-purpose boots, consider that while fleece and wool can be quite comfortable, they tend to hold onto moisture and may require extra maintenance during wet weather. You should also keep in mind that the Velcro closures will need regular cleaning to ensure they fasten properly. 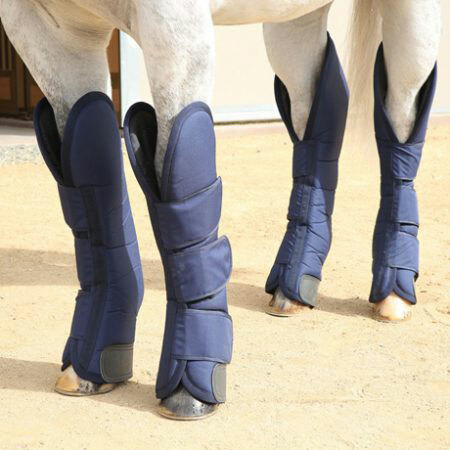 This type of boot can be used on the front legs and/or the hind legs, and are often used during turnout to protect the legs from the nicks, cuts, and knocks that can happen when your horse is having fun outside. They are also commonly used for flatting and light jumping, hence why they’re known as all-purpose boots – they can really handle it all! Cross country boots are designed to withstand the demands of a cross country course and are made to protect horses’ legs from interference, underbrush, and scrapes while not holding onto dirt, sand, or water. These protective boots cover the cannon bone as well as the tendons, and they’re typically lightweight, well-ventilated, and easily dried. They’re commonly made out of materials such as mesh, neoprene, leather-like materials, and nylon. Cross country boots come in pairs and will be made specifically for the front legs or the hind legs. And while they’re designed for riders who are out on a cross country course, you’ll still find them handy even when you’re out on the trails or hacking out in a field. 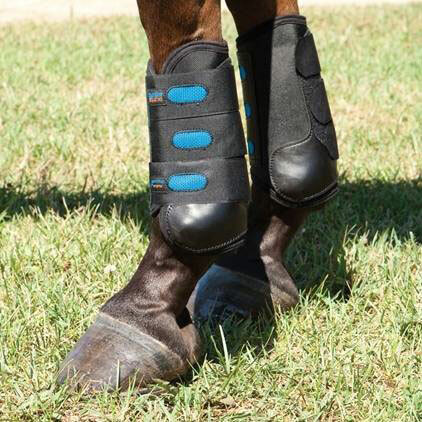 Sports Medicine Boots, which are also known as SMBs, are boots that wrap around the lower leg and the fetlock joint, providing coverage from below the knee to the top of the pasterns. 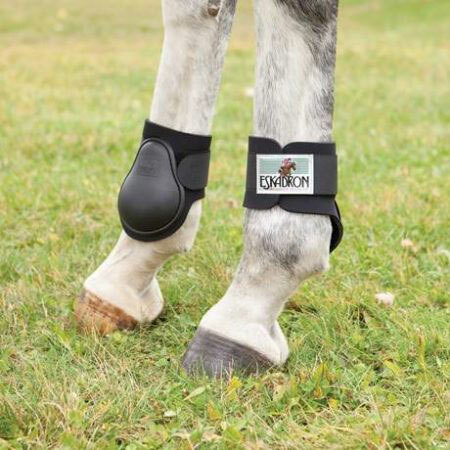 They have a unique strap that wraps underneath the fetlock and helps to provide some support to the suspensory ligament on both the front and the back legs. They are commonly made from neoprene because that provides some concussion protection as well as a small amount of stretch. This type of boot is perfect for riding sports that require intense work on the flat, such as barrel racing and cutting. Open front boots focus their protection on the tendons in the front legs while leaving the front of the cannon bone exposed. These boots can be made from a variety of materials, but are typically designed to be both breathable and lightweight. They often feature specially designed cut outs to accommodate the flexion of the knee and fetlock while the horse is jumping. This type of boot is most commonly used for jumping because the design allows the horse to feel that they have touched an obstacle while still providing protection from an overreaching hind foot. Ankle boots, which are also called fetlock boots, are designed to provide the hind legs with protection from interference. They come in two designs, both of which have similar functions. One design will wrap around the back of the fetlock joint and leave the front of the boot open, similar to the open front boot. The other has a design more comparable to an all-purpose boot, where they provide additional padding on the inside of the fetlock. No matter the specific design, ankle boots do not provide coverage for any area above the fetlock joints. Like open front boots, ankle boots can be made from a variety of materials. 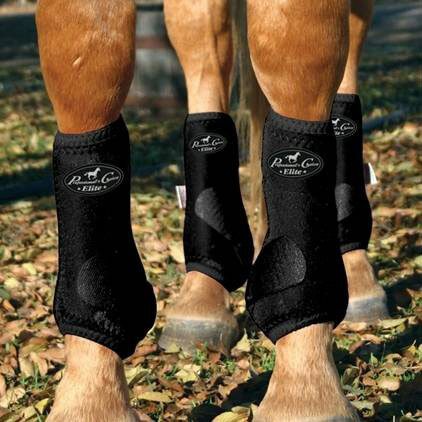 They are often found in a matching set with a front boot counterpart, so you can provide protection for all four legs. This type of boot is most suited for jumping, flat work, or any time a horse may be experiencing interference behind. Skid boots are hind boots designed to protect the back of the fetlock joint from friction when a horse stops suddenly. They are often made from a leather-like material and can be used over other boots or polo wraps. 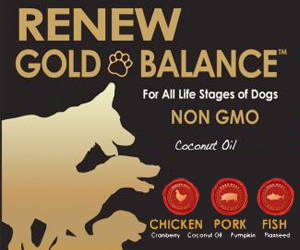 They are most commonly seen in Western disciplines where stopping suddenly is common, such as cutting and reining. 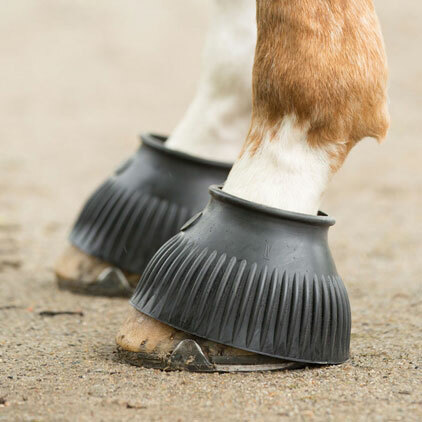 Bell boots, which are also known as overreach boots, are used on the front legs to protect the heels and to prevent a shod horse from their pulling shoes off by overreaching. They are commonly made from a durable rubber material, but can also be made of nylon, ballistic nylon, and leather-like materials. Some bell boots have fleece lining around the top to reduce the chance of rubbing, so look for that feature if you have a horse with sensitive skin. Depending on the style, the boots may need to be pulled on over your horse’s hooves or they may be secured with Velcro. 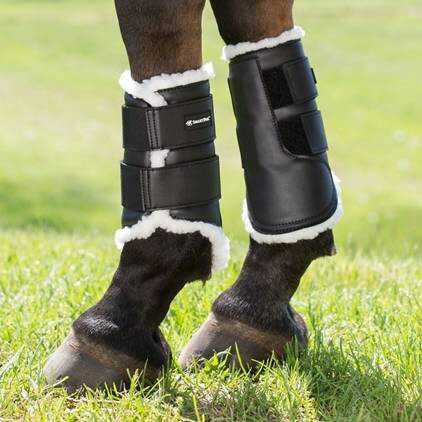 Bell boots are used in turnout as well as during exercise across all disciplines. Shipping boots are tall, protective boots that cover your horse’s legs from knees to heels in the front and from hocks to heels in the back. They tend to be loose-fitting around the tops and bottom, where they need to flex to allow the horses to move. They are designed to protect the horse’s legs while they are being shipped in the event that a loss of balance causes a cut or scrape. They are most commonly made of a durable nylon material with additional protection at the heels.